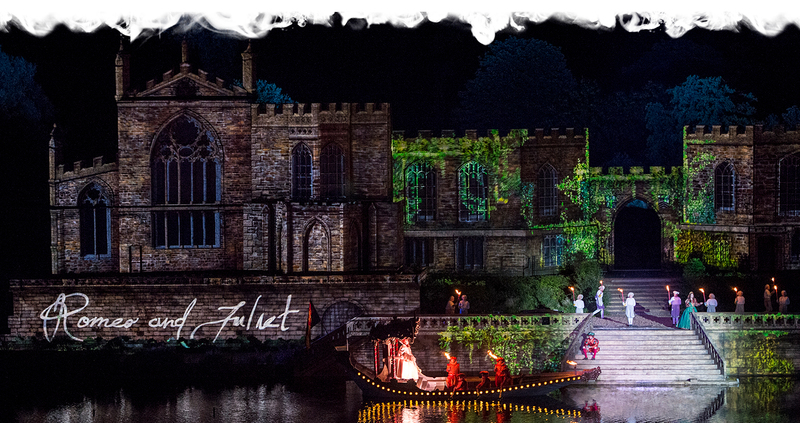 Your Kynren Adventure Starts Here! Up to 8,000 people attend each show, yet you’ll be surprised how quickly you can reach our site on the local road network, and how quickly we send off 8,000 visitors each night after the show. You are about to experience an epic adventure. Start your travel through time with our pre-show attractions, and join us early on show nights! Our Pre-Show Attractions open 3.5 hours before the show starts in the Summer months and 3 hours in September. There are lots of things to see, so please do come early to ensure you make the most of all there is to enjoy before the performance! Please note, the site is large and you should be prepared to walk to reach our Ticket / Security checks, and then to the various attractions on our site. If you think you might have difficulty walking please take a look at our Accessibility information for advice. Ticket / Security checks at least 45 minutes before the start of the performance. Kynren is an open-air, evening show, so wear something suitably warm and waterproof, as well as shoes you’re happy to walk in. Even hot summer days can turn into chilly nights. You can buy ponchos on the evening from our retail outlets, and you can have an umbrella up anywhere, anytime … except in your seat during the show. We take the safety and security of our visitors very seriously. On arrival at the site you will need to pass through bag and ticket-check (including random body scanning). Our bag check and body scan team are there for your safety. Please cooperate fully with all security checks and support these vital members of our team as they carry out important work. All entry constitutes consent to search. For a full list of restricted items please click here. Don’t forget your ticket! Tickets can be printed out or shown on your phone. If you do lose or forget your ticket, just come to the Box Office (to the right of Ticket Check) and we’ll print your ticket free of charge upon presentation of ID from the lead booker. Anyone with a bag will need to go through our bag check at the Ticket Check area. Small handbags are fine, but we do have a restriction on size: they must be no bigger than 40cm x 30cm x 20cm. Please remember to leave at home or in your car any other bag, e.g. backpacks, opaque carrier bags, etc. During your visit you can take photos and videos with your phone or camera except during the show. We don’t allow photography or video recording of the performance, we encourage you instead to access and share photos and videos from our media gallery. No food and drink (including water) that you bring with you is allowed to go further than Ticket Check, except baby food or food for medical conditions. You can purchase food and refreshments on site at our 1940's Bar - Food Village (including vegan, vegetarian and gluten-free options). Any drinks you purchase can be enjoyed on the Tribune however, please note that food is not allowed in your show seats. We have a number of retail and food outlets across the site. In the main our retail operates on a card payment only basis with the exception of hand waving flags available to purchase for 50p each. Food and beverages from the 1940's Bar -Food Village can be purchased with cash or card payment. We have one designated smoking area, this is clearly sign-posted. Smoking and vaping is strictly prohibited elsewhere on site. Kynren performances contain many special effects, including but not limited to, loud sound, audio visual, pyrotechnics, strobes, haze and lighting effects. We welcome visitors with disabilities and we have a wide range of facilities and arrangements in place to ensure all visitors can enjoy the show. We strive to ensure that the Kynren site is accessible to all visitors. Our main visitor path is DDA compliant with a natural fine stone surface. Kynren is situated in a conservation area and some of our pre-show attractions have grass or stone surfaces and wheelchair users may require the help of a Personal Assistant to access these areas. Our 1940's Food Village has large print menus available on request - just ask a member of staff who will be happy to assist. A word or pdf version of our access information is available on request. Please call +44 (0)1388 436 036 or email [email protected] to request your copy. Visitors with disabilities, who may not be able to attend the show unaccompanied or require a wheelchair space are entitled to one Personal Assistant ticket at no additional cost, subject to meeting our criteria. These tickets may be requested, with details of the qualifying criteria, by downloading an Access Requirement Form here.Alternatively you may request an Access Requirement Form by calling our Customer Care Line on +44 (0)333 300 3028. Please note that Personal Assistants must be physically able to undertake all access requirements on behalf of their companion. This includes helping their companion on the visitor path, which is 450 metres from the Blue Badge Car Park to the Tribune, and with evacuation in case of an emergency. For our visitors who are wheelchair users there is space reserved just in front of row A at surface level, with a seat in row A just behind for their Personal Assistant. All wheelchair users must be accompanied by a Personal Assistant who is entitled to an admission ticket at no additional cost. Other visitors in the same party will be seated as close as possible, subject to availability, in rows behind. Please call our Box Office on +44 (0)333 300 3028 (calls charged at local rates) to book seats in this reserved area and car park spaces can booked at the same time. No booking fee applies for tickets booked in the wheelchair user reserved area. For visitors with limited mobility, we have introduced the option to choose your seats in the Tribune on the online booking system. This allows you to opt for seats lower down or at the level of your choice, subject to availability. Your car parking voucher can be booked online too, including spaces in the Blue Badge parking if you are a holder of a Blue Badge permit. Blue Badge holders can book into the Blue Badge Car Park subject to availability. Those who don’t have a Blue Badge but are concerned about mobility are advised to book a ‘park and ride’ package from Car Park H. Car Park H is a flat tarmacked surface, easy to walk on with walking aids or to push a wheelchair. All of the shuttle buses have space for one wheelchair at a time and any walking aids are welcome. Our shuttle bus drop off is adjacent to the Blue Badge Car Park from which our visitors need to be able to travel 450 metres down a DDA compliant footpath to take their seats. We recommend that guest with disabilities that require a taxi to drop them off or pick them up should pre-book a space in our Blue Badge Car Park, as for security reasons, the site does not have a taxi waiting area. In order to book a space, visitors should be a Blue Badge holder or meet the qualifying criteria for a Personal Assistant ticket. Visitors who do not meet this criteria are recommended to book a Ride Only shuttle bus ticket from and to Bishop Auckland Bus Station in the town centre as otherwise the walk to the Kynren site is just under 1 mile. There is a small car park next to the Bus Station where your taxi may drop off and collect you after the show. The site has a limited number of park benches, however the 8,000-seater Tribune opens two hours before the start of each performance should you wish to take your seats early. You are welcome to get in and out of the Tribune as many times as you wish before the performance starts. A limited number of wheelchairs are available to hire in advance of the show subject to availability. If you do have your own wheelchair or walking aid we would encourage you to use them. The wheelchair hire is free however, at the time of booking you will be charged a fully refundable deposit of £15.00. This will be refunded to you within 7 working days of the show provided the wheelchair is returned undamaged. To reserve a wheelchair please call +44 (0)1388 436 036. This line is open 9am-5pm Monday-Friday. These are located at the Welcome Plaza, immediately adjacent to the Blue Badge Car Park, and directly behind the Tribune. 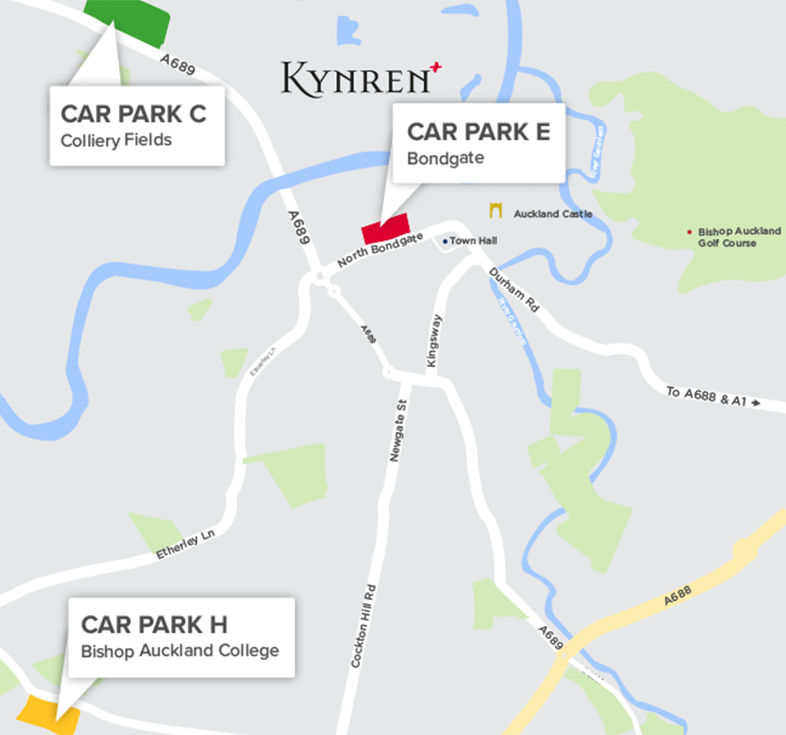 If you chose to arrive to Kynren by car, you'll need to book your preferred car park when you book your Kynren tickets. To help you decide, we've included some useful information about our car parking options below. We have 4 options for parking - Car Parks C, E, H and Blue Badge Car Park A. You can Park & Walk from Car Parks C and E, please make sure you check the distances by clicking on the map below. For those who prefer to take the weight off their feet, you can Park & Ride the shuttle bus to the Kynren site from Car Parks C, E and H.
Parking is available onsite for Blue Badge holders only; you’ll need to pre-book your space, subject to availability. For more information on this car park see our Accessibility section. If you live locally you can take the shuttle bus to Kynren: your pick-up point is Bishop Auckland Bus Station, and you must pre-book when you buy your Kynren tickets. Last minute change of mind? Shuttle tickets cannot be booked from the car parks when you arrive, and visitors without shuttle tickets will need to walk. However you can buy shuttle bus tickets for the return journey only for £5 per person from the retail outlets when you arrive onsite. Pre-booked ticket-holders have priority over those bought on the day. You’ll be surprised how quickly our 8,000 visitors leave the site each night. We aim to say goodnight to the last bus in less than 45 minutes after the show ends. you'll find we are only a short journey away.